What presented here is something very similar to a game, but at the same time it is something capable of conveying a message of a tremendous importance: wake up! It is time for a fresh view on what is happening on this planet! We believe that humankind is entering in a crucial moment in which drastic transformations are required to cope with the issue of sustainability. Since we are not prophets of doom, we believe that important adjustments can be done without getting back to the dark ages. However, in order to fix problems it is important to understand their causes. We are worried by the fact that the debate over sustainability is still intoxicated by the use of old and obsolete perspectives based on scientific analysis that have been proven completely unable to explain the existing crisis. Modern economists seem to believe that if a country is not doing well in economic terms it must necessarily depends on the fact that the country is implementing bad economic policies. The idea that a bad economic performance can be generated by lack of natural resources is not even taken into consideration. According to the narratives used so far by economists perpetual growth is a natural phenomenon and if it is not happening this is due to bad economic policies. With the Sustainability Sudoku we provide a simple example showing that things are not that simple and that there are biophysical constraints determining what an economy can or cannot do. Against the law of thermodynamics invisible hands and silver bullets simply do not work. The vast majority of those reading this (living in non-oil-exporting countries) have been told year after year that “our” dependence on imported oil is an intolerable situation to be fixed as soon as possible (see the video on the left). These statements and the consensus that they get in the society clearly show a total lack of understanding about the functioning of modern societies. Developed societies can enjoy a very high standard of living exactly because they import and have been importing a massive amount of oil in the last decades. In fact, a society becomes rich when uses energy not when it produces energy carriers. This is a quite simple concept that seems to be missed by the vast majority of sustainability scientists and politicians. The idea that the economic performance of a society will be better off by investing a significant fraction of its production factors in producing energy carriers, rather than investing those production factors in using energy carriers to produce goods and services is quite doubtful. Especially when considering that developed countries can get the energy that they consume almost for free (in biophysical terms) just by increasing their level of debt . . .
We guarantee you that by playing the Sustainability Sudoku you will manage to get a better understanding of the key role that imports of fossil energy play in making possible the standard of living enjoyed by developed society. This understanding is essential in order to make it possible an informed deliberation about alternative models of development. The Sustainability Sudoku has been developed as a simplified application of the analysis of the metabolic pattern of modern societies using the accounting method MuSIASEM. The Multi-Scale Integrated Analysis of Societal and Ecosystem Metabolism is an innovative method of accounting developed using principles of Complexity Theory capable of keeping coherence when dealing with datasets composed by information referring to different dimensions and different scales of analysis. This accounting method can be used as: (i) a diagnostic tool to study societal metabolic pattern – YES, societies as human beings do have a metabolic pattern, they need a continuous flow of inputs (energy, materials and water) and they must dispose of a continuous flow of outputs (solid wastes, liquid effluents, gas emissions); and (ii) a simulator tool to characterize the desirability, viability and feasibility of scenarios. The MuSIASEM system of accounting describes at the same time the metabolic pattern of (1) the whole society (at the level n); (2) the functional compartments of society (at the level n-1); (3) the sub-compartments of the compartments (at the level n-2); (4) functional parts of sub-compartments (at the level n-3). For this reason it can establish a relation of congruence between the profile of allocation of production factors available to society (e.g. human labor, power capacity, energy inputs, land, etc.) across the various compartments, sub-compartments and functional parts. The need of congruence implies a Sudoku effect in the multi-scale representation of the metabolic pattern. If labor, power capacity and energy carriers are invested in producing they cannot be invested in consuming. The concept of metabolic pattern implies that production factors are required not only for producing goods and services, but also for consuming. Contrary to what is believed by the majority of the people, when analyzing the profile of allocation of power capacity (technical capital or machines) one discovers that the vast majority of technical capital is used in the household sector for consuming and not in the Paid Work sector of the economy where production takes place! Mario Giampietro, Richard J. Aspinall, Jesus Ramos-Martin and Sandra G.F. Bukkens (editors), 2014. 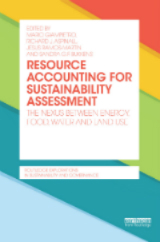 Resource Accounting for Sustainability Assessment: The Nexus between Energy, Food, Water and Land Use. Routledge, 250 pp. Mario Giampietro, Kozo Mayumi and Alevgül H. Sorman. 2013. 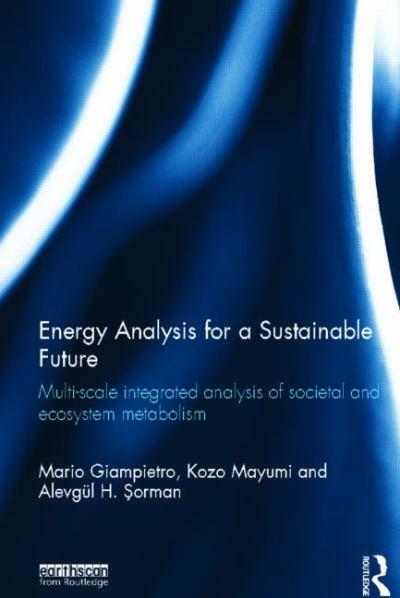 Energy Analysis for a Sustainable Future: Multi-scale Integrated Analysis of Societal and Ecosystem Metabolism. Routledge, 339 pp. Mario Giampietro, Kozo Mayumi and Alevgül H. Sorman. 2012. 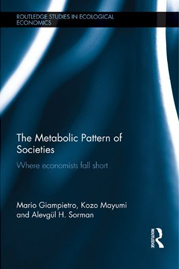 The Metabolic Pattern of Societies: Where Economists Fall Short. Giampietro M. and Mayumi K. 2009. 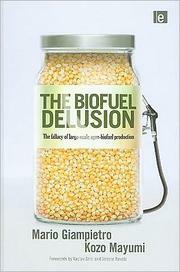 The Biofuel Delusion: The fallacy of large-scale agro-biofuel production. Earthscan, London, 320 pp. Polimeni, J., Mayumi, K., Giampietro, M., and Alcott, B. 2008. 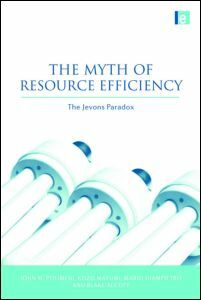 Jevons’ Paradox: the Myth of Resource Efficiency Improvements. Earthscan, London, 192 pp. Even if based on scientifically sound conceptualizations we have to clarify that the Sustainability Sudoku is not a model but a tool for educational purposes only. The Sustainability Sudoku should not (it literally cannot) be used for decision-making, since the quantification used to send the message are too simplistic. Strong assumptions have been made to perform this exercise (which can be checked in the dataset). In addition, other key issues that should be considered in a real application such as water and socio-economic variables are not included in this simplified application. The Sustainability Sudoku has been developed by humans (just like you). If you have comments and suggestions on how to improve this website or if you find some bugs, please use our feedback form! The Sustainability Sudoku (version 1.0, Oct. 2014) , by the IASTE research group. The use of this approach for sustainability discussions requires tailoring the analysis to a real situation using participatory processes for quality control. For instance our team is currently working in collaboration with the Ministry of Planning and Development of Ecuador to implement the MuSIASEM approach within their Unit of Prospective Planning. Examples of results obtained using a more elaborated application of the MuSIASEM approach on three case studies (Mauritius, Punjab (India), and South Africa) are available at the website: nexus-assessment.info . People interested in applying this approach to a specific situation can contact us here. The Sustainability Sudoku by the IASTE Research Group of the Universitat Autònoma de Barcelona (UAB) is licensed under a Creative Commons Attribution-ShareAlike 4.0 International License.